The notion of an author using the platform of fiction to indirectly communicate his or her personal philosophy is not a particularly new one. The French existentialists famously did so, and one could even accuse John Steinbeck of such an endeavor. It’s the course charted by noted sports “mental coach” David L. Cook, who has been working with pro athletes and business executives for decades to help their performance. His novel Seven Days in Utopia, Golf’s Sacred Journey (also now a film releasing next month in theaters) wraps a story around the key principles of Cook’s philosophy and packages it as a pseudo-fable about finding the secret to success, whether in golf or life in general. Is this repackaging of Cook’s brand a better way to communicate his life lessons? The simplest answer is that something about the storytelling in Utopia feels a bit clunky, and this makes the story never quite achieve full lift-off. Despite the shortcomings in craft, however, Cook’s messages are solid, and his approach is refreshingly not didactic, allowing room for the reader to ponder and mull without feeling ambushed by a zealot. Over the course of the next week, Johnny plays Miyagi to the narrator’s Daniel, putting him through various challenges designed to improve the mental part of the narrator’s game, like painting a picture of a shot before he takes it or piloting a small plane to drive home the importance of a pre-round checklist. Perhaps the most compelling part of the novel, however, is the climax, when Johnny challenges the narrator to make a list of all the lies he believes about his life. 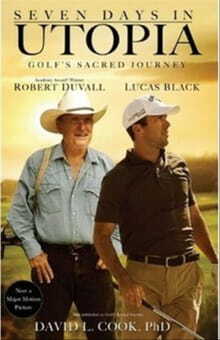 Some are entirely golf-related, things like “Failure in golf is failure in life,” but the list also includes, “God is a crutch for the weak.” After making this list, the narrator buries it, symbolically having learned Johnny’s lessons, and returns to his life a new man. It’s clear Cook isn’t trying to set the literary world on fire with Utopia, so an attempt to dissect the novel’s prose might be misguided. Even so, there are some cracks. Most notably, the novel’s protagonist is never given a name, nor any real personality, which makes it hard to sympathize with him. Now, this could be because Cook imagines him being an everyman in a Pilgrim’s Progress-style fable. But fables typically are told in the third person omniscient point of view, to allow the narrator to give the story the kind of sweep necessary for the moral lessons imparted through fables. That isn’t the case here. Setting aside his methods, Cook’s messages are much more effective, likely because he has loads of experience honing these principles. One can almost imagine Cook standing next to a PGA pro, whispering in his ear just like Johnny does in the book. Thus, for golfers, Utopia will likely be the “elevate-your-consciousness”-type book it’s touted to be. Its outside-the-box approach to the sport and life packs quite a punch. For those of us not immersed in the sport, Cook’s lessons might not translate as readily, but still, the book’s exhortation to take an eternal perspective on one’s life is a refreshing message, and at its heart, that’s what this is a story about, not shaving a few shots off the back nine.